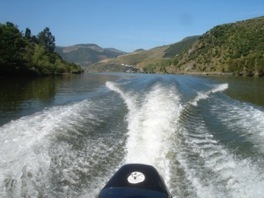 There is nowhere like the Douro Valley. Nowhere. Words and superlatives are stretched to breaking point to describe it and then discarded when found to be totally useless. The message is simple: if you are going to visit only one wine region in your life and you want stunning, rugged, raw, primal beauty then get yourself to the Douro. The vistas here are not picture postcard pretty. The vineyards are not manicured. No make-up has been applied. 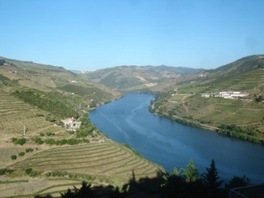 The Douro is the world’s oldest demarcated wine region, having been mapped out in 1756. It is, of course, the home of port, a wine that, at its best, is one of the most sublime essences produced on the planet. The region’s fame rests on this storied nectar but such is the long shadow cast by port that the significant quantity of table wine produced in the valley gets little attention. Change is in the air, however, and much of that change is being driven by a loose association of five producers who style themselves ‘The Douro Boys’. The quintet comprises: Quinta do Vallado, Quinta do Vale Meão, Quinta do Crasto, Niepoort and Quinta do Vale Dona Maria. 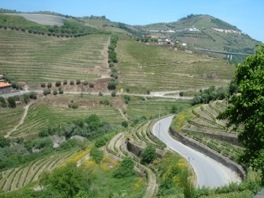 The Douro vineyards are some of the most spectacularly sited in the world. These producers represent the new face of the Douro, responding eagerly to the sad but true reality that the world no longer has the inclination to linger long after dinner over port and stilton and cigars. Where others have moved reluctantly to accommodate change these have eagerly welcomed it. They have done so by virtue of shifting their emphasis away from port and towards the production of table wines. Cussed traditionalists may harrumph in disapproval but in fact what they are doing is neither new nor revolutionary. They are simply returning to what was the practice in the early years of the 18th century, when the wines were shipped unfortified. The practice of adding brandy developed gradually and only became an entrenched part of the process much later. When it comes to marketing and promotional activities the Douro Boys hunt in a pack but otherwise they are completely independent of each other. Each still has a commitment to making port but it is when the talk turns to discussion of table wines that their eyes really light up. None more so than those of João Ferreira Alvares Ribeiro, owner of Quinta do Vallado (who is equally comfortable talking about his many visits to Ireland and Britain to shoot woodcock). Until recently he made his living as a banker but the ‘Ferreira’ in his name indicates that he is Douro aristocracy, being a direct descendent of Dona Antónia Adelaida Ferreira. Dona Antónia was the most formidable figure in the port trade for a good part of the 19th century. By the time of her death in 1896 she owned two-dozen quintas, including Vallado and others such as Vargellas and Vesúvio, the latter two now being the prize possessions of Taylor’s and the Symington family respectively. You can travel upriver by boat or train. Both offer stunning vistas. Vallado was part of the Ferreira port business but when this was sold in 1987 the quinta remained in family ownership. Table wine production, both red and white, began in 1990 and today the vineyards stretch to 70 hectares, 53 of which are recently planted. The remainder were considered to be of such quality that they were retained and now produce a ‘field blend’, where the exact proportion of each grape variety is unknown, for the top wines. 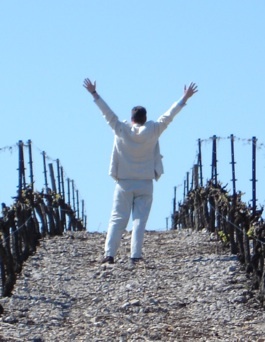 But in many respects it is the basic wines, the Vallado Branco and Tinto, that are the standard bearers here. They are lively and fruity and even in a difficult, very hot year like 2009 the Branco still retains a tasty tingle on the palate. 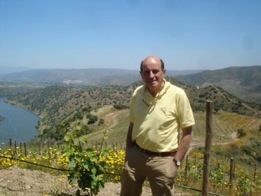 The Tinto is, as winemaker Francisco Spratley Ferreira puts it, “easy but has personality”. The Reservas are equally impressive but their price tags reflect the increase in quality so they will have to wait for better times, though if fairy godmother is waving her credit card don’t hesitate. 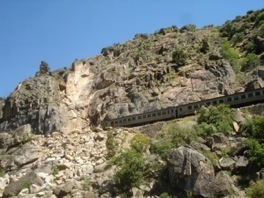 Vallado is located a stone’s throw from Régua, the town that marks the western limit of what might be called the Douro heartland, where the vistas defy description. From here to Quinta do Vale Meão (say it like a cat) as the crow flies is hardly more than 50 kilometres but by road it is a tortuous and twisting journey that frays the nerves. Far better to go by train. The railway line was built in the 1870s and for most of its length it hugs the river, getting so close at times that it feels like you could reach out and touch the water. Some of the stations are nothing more than ghostly stops where the train interrupts its creaking progress for a minute. Nothing moves, no passengers appear or disappear and, with a wheeze, it departs again. The seats are seldom used, for the passengers spend most of the time standing at the windows, indulging in repeated bouts of breath-taking and jaw-dropping. Meão is owned by Francisco Javier de Olazabal, better known as Vito, and if there is a greater character to be found in the whole of Portugal I have yet to meet him. His conversation skips from anecdote to tale to yarn, with the odd bit of wine information thrown in to fill gaps. His wines are lavish and sumptuous, lush textured and rich in fruit, with hints of liquorice, chocolate and spice thrown in to complete the symphony. But it is the vineyard visit that sticks in the memory. Travelling with him by battered 4x4 up vertiginous, deeply rutted racks is not for the faint hearted, nor should it be attempted after lunch, yet the views it yields are beyond spectacular. Wild flowers abound and vines too but it is the great sweeping bends of the river, as it saunters and shuffles between the hills, that really catch the eye. Nothing could equal this, you say to yourself. Left, des res sandwiched between vines and river. Right, Vito - Francisco Javier de Olazabal. Until you get to Quinta do Crasto and gaze out at the Douro Valley over the infinity pool with the sun setting at your back. Throw in a glass of the white Crasto Douro 2009 and a handful of warm, freshly toasted almonds and you might be forced to revise your opinion. Crasto is owned by the Roquette family and although its history can be traced back to 1615 the latest chapter, as an independent quinta responsible for every stage of the production and marketing of its wines, began only in 1994. The style here is vigorous and strong and the winemaking is overseen by Australian winemaker Dominic Morris, who visits a couple of times a year. Only after eight or 10 years in bottle do the wines show at their best, when the strong tannins have subsided and the flavours begun to knit. Of particular interest is ‘Xisto’ a red wine made in collaboration with the Cazes family of Lynch-Bages in Bordeaux. This is serious, deep-flavoured stuff that warrants the finest steak served sizzling from the barbeque. 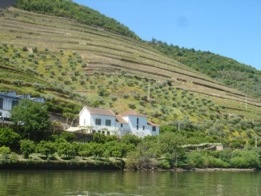 Quinta do Crasto and Niepoort’s Quinta de Nápoles could be considered near neighbours except for the fact that the river runs between them, necessitating a 20-minute car journey to get from one to the other. The buildings here are spanking new and clad in dark schist, giving the impression of a long, low-slung fortress. 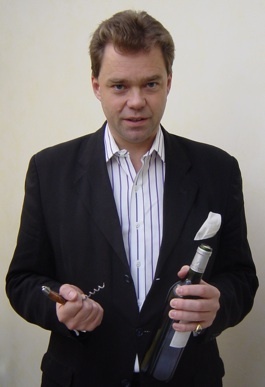 Nobody has done more than Dirk Niepoort to raise the Douro’s profile and as an ambassador for the region he would be hard to beat, though his wines do an excellent job in that department too. They are made with consummate skill by Luís Seabra and encompass a broad range of table wines as well some of the finest ports. Anything produced under the Niepoort label is worthy of serious attention. The quintet is completed by Quinta do Vale Dona Maria, owned by Cristiano van Zeller and in production since 1996. Here all the red wines are traditionally foot-trodden in open stone lagares and the concept of a ‘field blend’ is taken to its ultimate expression, with one of the reds being made from 41 different grape varieties. Truly, they do things differently in the Douro.